// type name, since it's mentioned in the Zombie declaration. // so it is no longer on that grid point. // return "Player couldn't move; player stands." // returns "Player walked into a zombie and died." // Move all zombies. Move each zombie. Mark the player as dead if necessary. 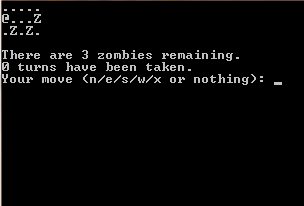 // Release any dead dynamically allocated zombie. // in the indicated direction would run off the edge of the arena. // to move and returns true.